Place the prepared poblano chiles in a heatproof container deep enough to hold liquid. In a large 12-inch, deep skillet, heat the oil over medium heat. Add the onions and let them cook, as you stir occasionally, for about 8 to 10 minutes, until completely cooked, softened and the edges are barely beginning to brown. Add the garlic, stir and cook for a minute, until it has softened and become fragrant. Add the the oregano, thyme, bay leaves, whole cloves and peppercorns, stir and let them cook for a minute. Pour in the vinegars, salt and sugar and stir. Bring to a simmer and continue cooking for about 3 to 4 minutes. Turn off the heat. Pour the pickling marinade on top of the chiles and let cool. Once it cools, cover with a lid or plastic wrap and refrigerate. If using same day, let them marinate for at least an hour. The pickled chiles will keep in the refrigerator for a couple weeks. Ah lo siento mucho, Erika, aquí está la receta detallada. https://patijinich.com/es/recipe/sandwich-de-atun-y-queso-derretido-con-rajas-de-poblano-en-escabeche/ Me parece que tal vez lo cocinaste un poco más de lo debido. Saludos! What size container do you need for this recipe? Oh you can use whatever size containers you have on hand, Loraine, even if you have to split up the batch. Enjoy the poblanos. Thanks for sharing this recipe Pati. 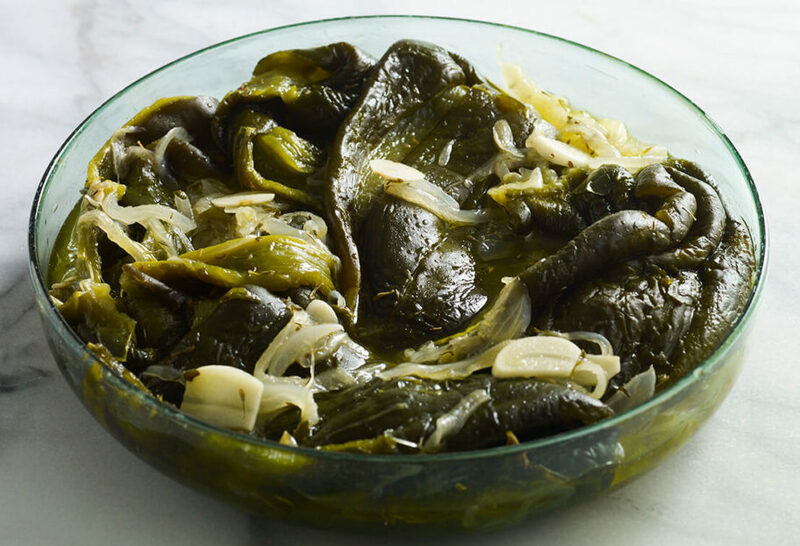 I love poblanos and this looks like another great way to enjoy them. Do you have any tips on the best way to char the chiles? I’ve just started watching your show and love it! My mom recently passed away after a horrible illness. Watching your show had inspired me to honor her memory by making some of the dishes she taught me to make. Thank you! I do have a question though on making chili rellenos… We have a huge garden and my husband grows tons of organic chilies. I try and make lots of rellenos but it’s so time consuming. Do you know any shortcuts? Can I to any part of it ahead of time? My husband loves my recipe as I stuff with cheese and roast beef. Thanks for your help and your great show! I’m so sorry to hear about your mother…but being in the kitchen is a lovely way to honor her. You can make the sauce and roast the peppers beforehand to save some time. You can even put both in the freezer for whenever you feel like some Chiles Rellenos. Besides sandwiches what else can I use the pickled poblano? The recipe was easy to make. Everything….salads, tacos, sopes…or eat them by themselves. This recipe looks delicious! Could you please show more vegan recipes! I love your style of explaining your recipes! Oh no! Good tip, James. Can you tell me if the peppers would freeze ok? I would probably freeze them in the pickling brine? Now for the tunamelt..thank you so much.. I have made this twice and I’m hooked!! Me encanta todo lo que haces y gracias por todo lo que nos elseñas. I will try this awesome recipe! I love poblano pepper!!! Thank you so much! Poblanos are so good! Enjoy them Maggy! If I don’t have rice vinegar,could I substitute white or red wine vinigars? Just use more of the white vinegar, it will be delicious!